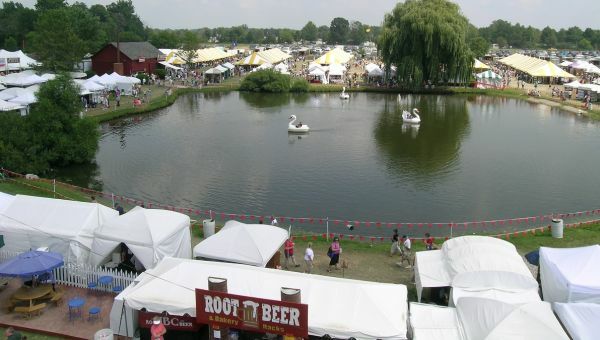 It’s the perfect recipe for anyone who loves art, theater, and the fascinating culture of the Amish when some 300 artists display their incredible array of creations around a scenic pond at the Amish Acres Heritage Farm and Resort in Nappanee. 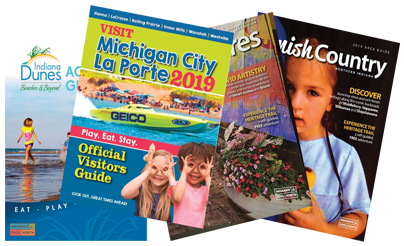 The Amish Acres Arts & Crafts Festival is proudly celebrating its 56th year and continues to receive accolades and recognition as one of the top art fairs in the nation and a “don’t miss” festival in general. Naturally, art takes center stage during the four-day event, scheduled for Aug. 2-5 this year (9 a.m.- 6 p.m. Thursday, Friday and Saturday; 10 a.m.- 5 p.m. Sunday). Artists come from the far corners of the U.S. and just about every state in between, with some 30 states represented. Festival-goers love to discover that their favorite artists have returned for yet another year. Connecting with them and learning about their creations is one of the festival’s most enjoyable aspects. And what creations you’ll find! Of course, there are paintings that burst with dreamy landscapes, florals, and faces, plus sculpture, photography, jewelry, ceramics, glassworks, and other works that spring to mind when art is mentioned. But this fair brings a host of unique creations you might not expect. Look for hand-painted wine glasses, handcrafted soaps, t-shirt quilts, wooden puzzles and toys, Amish quilts and pillows. One artist creates huge colorful garden flower ornaments from melted vinyl records and another paints old records and turns them into clocks. Local Amish crafters display their furniture, quilts, leatherworks, and even yard art made from horseshoes in the Countryside Shoppes Pavilion. Throughout the festival, enjoy nonstop free entertainment on four stages. Food booths offer a variety of options, including famous breaded Hoosier tenderloins, pretzels and elephant ears. There’s more in store on the grounds of Amish Acres, the only Olde Order Amish Farmstead listed in The National Register of Historic Places. Wagon rides take you around the 80-acre farm and Amish Acres shops sell delicious baked goods, noodles, meats and cheeses to take home along with your art finds from the festival. The Inn at Amish Acres is offering special overnight packages for the weekend. While you’re visiting, you can watch talented professionals performing in live musicals staged in the historic Round Barn Theatre, a 1911 barn transformed into a state-of-the-art venue. Barry Manilow’s Broadway hit, Copacabana, is playing four times during the festival weekend. Don’t miss a chance to see Plain and Fancy, a much-loved Round Barn musical that tells the Amish story beautifully. It’s a great addition to your artsy weekend. Admission to the Art Festival is $7 for adults, $6 for seniors and youth 12-17, and free for active military personnel and children under 12. Parking is also free.